It was just another Saturday night, but I was smart enough during the day to let my human stick with her real life. That means, I didn’t spend too much time on during the day so I didn’t get too much Second Life before the night rolled in. It was a really nice Saturday night. I had received an invitation to Sommer Sheperd’s 5th Rez Day party and I was particularly happy about going because she is not only a Dreamgirl, but also a neighbor — just over yonder as the seagulls flies across the sims in SL New England islands. at the Elite Jazz Ballroom. The party was beautifully planned by sister Dreamgirl Marcy Wilson for her best friend Sommer. 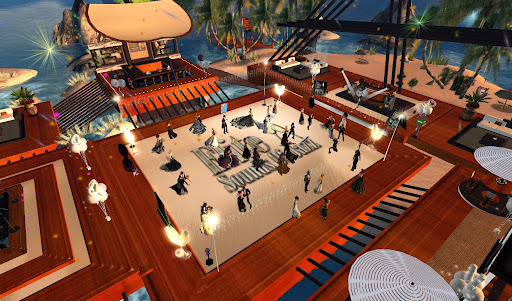 The theme was formal and the location named Elite Jazz Island had a gorgeous ballroom. When I arrived Maxx Sabretooth was singing an amazing set of tunes that just warmed my heart for sure, and which I’m certain Marcy had some hand in picking. There was a large crowd of Sommer’s friends I knew from the Junkyard. And there she was, graceful, charming and as beautiful as a bride, Sommer. Her dancing partner for the evening was Dreamguy Reno Tronco. This entry was posted in Journal and tagged Friendships, Parties, Second Life, Socialite. Bookmark the permalink.